Almost 50 players who have taken part in the French Exchange trips have gone on to play professional rugby league. 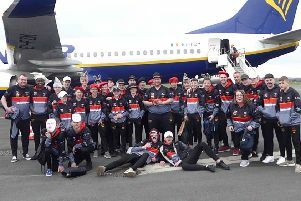 Almost 50 players who have taken part in the Shaw Cross French Exchange trips over the last half century have gone on to play professional rugby league. 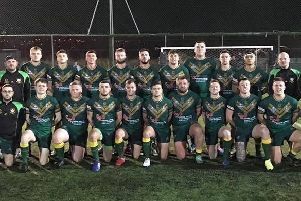 Among the famous players to have represented Shaw Cross are former Wigan, St Helens and Castleford forward Lee Gilmour and Nick Fozzard, who played over 300 games for the likes of Leeds, Saints, Castleford and Huddersfield. Shaw Cross professional players that have been on the French Exchange. Chris Annakin (Wakefield), Danny Annakin (Dewsbury), Peter Armstead (Batley, Wakefield), John Carroll (Leeds, Batley, Hull and Halifax), Joe Chandler (Leeds, Halifax, Batley. Oldham), Mark Cook (Mansfield, Batley), David Dyson (Halifax, Bradford Northern), Andrew Fawkes (Dewsbury), David Finnerty (Halifax, Doncaster), Jack Flynn (Huddersfield Giants), Nick Fozzard (Leeds, Huddersfield), Brandan French (Featherstone), David Garforth (Dewsbury), Peter Garner (Dewsbury), Michael Gibson (Keighley), Lee Gilmour(Wigan, St Helens, Huddersfield, Castleford, Wakefield), Tom Griffiths (Wakefield), Timothy Lumb (Hunslet, Sheffield), John McGowan (Batley), Curtis Naughton (Hull, Bradford, Leigh), Danny Naughton (Huddersfield), Sam Ottewell (Featherstone), Andrew Parkinson (Halifax, Batley), Josh Pinder (Huddersfield), Luke Powell (Wakefield), Adrian Ripley (Wakefield), Gurdeep Ryatt (Hunslet), Andrew Scanlan (Keighley), Andrew Smith (Keighley), Danny Smith (Wakefield, Huddersfield), Graham Summerscales (Dewsbury), Martin Summerscales (Dewsbury), Gordan Talbot (Dewsbury), Pat Walker (Dewsbury, Sheffield, Batley), David Walton (Halifax), Nathan Wright (Featherstone). Professional French players that have gone to Shaw Cross and invested their time with the French boys on tour: Olivier Elima (Catalan Dragons, Bradford, Wakefield, Castleford and Pujol), Mika Simon (Catalan Dragons, Wakefield), Eloi Pelissier (London Broncos, Catalan Dragons, Leigh, Lezignan), Jean Philippe Baile (Carcassonne, Bradford, Catalan Dragons).